I had a pleasant exchange with an intern – in the end a class of interns – at the Brazilian newspaper “O Estado de São Paulo” a couple of weeks ago. The questions were insightful. I tried to answer in an informative and direct manner. Indeed, things are not going well at Petrobras lately, and looking at the politics of Pdvsa and Petrobras next to one another is a useful exercise. Here’s the interview. 1) Do you agree that PDVSA and Petrobras have both had political mishaps in their administrations? Why? Yes. Hugo Chavez used Pdvsa as the “goose that lays the golden eggs.” However, he took so much from Pdvsa — especially to support his frequent election campaigns, before each of which he increased public spending to win votes — that the “goose” has been left to starve. Chavez’ revolution was, in his own words, an “oil revolution” and “oil socialism.” However, he did not understand how to run the national oil company. While he distributed largess from the country’s oil wealth to the poor, he was incapable of introducing a new, higher productivity of labor in Venezuelan society, which is what any real social revolution requires for success. He left the country in a very dangerous situation with a shortage of foreign exchange. If the price of oil falls further due to a US & EU accord with Iran and/or an improvement in the oil production situation in Libya, and Iraq, then Venezuela will face a deep crisis. Petrobras too, under Lula, began to be viewed as a cash cow after it discovered the pre-salt. As a president. Lula was much more competent organizationally and in economic matters than Hugo Chavez. However, he too made the mistake, to use another English-language aphorism, of “counting his chickens before they were hatched.” Petrobras has indeed made rich oil discoveries, however they are extremely expensive to develop and they are very large-scale projects. They severely stretch the capacity of Petrobras and the national oil sector of Brazil to develop them, both from a manpower and a material point of view. 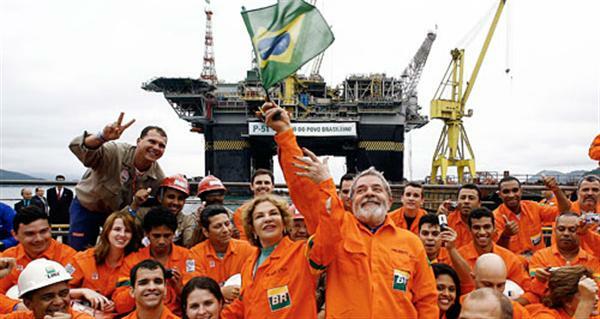 Lula, and to some extent Dilma too, but also many politicians of other parties, have been too eager to “cash in ” on the benefits of the new oil without realizing how much expertise and financing — and time — it takes to develop such fields well. The state will now have to further cut back on the over-ambitious requirements it has imposed for domestic labor content, and domestic material-parts content, and to reduce its high rents-seeking from the projects. If the state does not do this, the pre-salt projects will become more and more stalled and poorly executed. 2) Do you think that PDVSA can serve, to some extent, as a cautionary tale for Petrobras in terms of juggling oil production and political administration? Why? Yes. In Venezuela, the animosity of chavismo against the old leadership of Pdvsa was matched by the animosity of some of the old management for Chavez. This social and political clash over the control of the national oil patrimony finally led to the “paro” (the strike by the old-management against Chavez in 2002-03). This strike was waged without either side taking much account of the interests of the nation as a whole, and led to the near destruction of the national oil company. Most of Pdvsa’s experienced workers and managers were fired or they quit and many of the nation’s oil fields were sabotaged. Both sides, to varying degrees, were responsible for the sabotage and other damage to Pdvsa’s capacity. The country has still not recovered from this disaster. Chavez’ 13 years of incompetent management and over-spending of oil income then further decimated the company. One of his worst errors was eliminating the oversight of an independent oil ministry over the state oil company Pdvsa. While many poor people welcomed the populist social assistance Chavez’ government provided, and they deserved more attention from the state, Chavez did not at the same time create a spirit of sustainable and enhanced productivity among the people of Venezuela and, by now, the country is much more dependent on imports from “el imperio” than before he arrived. Brazil still has time and space, for the government to effect the reforms necessary to keep Petrobras a competent and productive entity. However, the oil sector has to be further de-politicized and oil income treated more realistically. The struggle over dividing up ol-rents distracts from focus on making fundamental progress in national productivity. 3) What are the main administrative differences between the two? PDVSA has very few well-trained and competent managers left post-paro of 2002-03. Since then, the extreme antagonism of chavismo to the opposition, and, in particular the high degree of antagonism Chavez had to almost all the universities in Venezuela which had decades of experience training oil-sector professionals, has the result that, today–12 years later–Pdvsa still does not have sufficient well-trained new engineers and managers. In addition, a very important aspect is that not only Pdvsa leadership, but the leadership of the state, now under Maduro, is ideologically stuck in chavismo’s simplistic economic understanding. Because of this ideological stagnation, matters are very difficulty now. Although all leaders of chavismo now know they need to urgently ‘reform’, they are incapable of imagining what sorts of economic and organizational measures need to be taken. In contrast, The Workers’ party has a long history of organization and work as an opposition movement before attaining power in Brazil. It’s organizational and ideological capacity is quite superior to that of Chavez and Chavismo. On the one hand, in the response to the crisis over the past several years, the Brazilian state, like many others in Latin America, made many prudent increases to public spending to stimulate the lagging economy. However, the Workers Party and many others went overboard. An unrealistically optimistic assessment of the income the state would be receiving from the new oil discoveries, and expectations about the boost to employment and business it could expect from requiring high levels of domestic content, have contributed to the present high inflation rates and growing problems with oil projects and with Petrobras’ health. This needs to be rectified. In this, one of the deepest similarities to Venezuela, chavismo and Pdvsa is that the Brazilian state, political parties and Petrobras have become overly enamored with the possibilities of reaping fantastic petroleum rents. The mentality begins to grow that this oil somehow means that Brazil will be absolved from the ordinary rules of economics that any other state and society has to obey. Somehow oil rents will make everyone wealthy without developing the social-productive base of society in the way other nationas must. This is the illness of “rentismo”. Venezuela is like a chronically terminal “rentismo” patient. Brazil has caught a new “rentismo” infection but can still be cured without such a fundamental upheaval of society and its national oil company as is required in Venezuela. 4) Both PDVSA and Petrobras have some measures to insure that they are part of all national oil explorations — PDVSA and 51% ownership, Petrobras and the 30% ownership. How do you see this clause? Pdvsa is a company with severe managerial and technical incapacities, and is chronically depleted of the operating capital it needs to sustain itself by the politically motivated demands of the office of the president of the Republic who treats the company like its private cash-box. Therefore, Pdvsa is incapable of managing (i.e., being the operator) of its own fields. It is best, for the time being, that Venezuela re-establish a competent and INDEPENDENT ministry of energy to oversee the oil sector — to oversee both Pdvsa and foreign firms’ activities– and for Pdvsa to temporarily accept that foreign oil companies, with more managerial and technical capacity, be the operators of large and complex operations. The Norwegians did this many years ago when they started out. Then Pdvsa can again, slowly , retake its rightful position as the operator of its own national fields as it builds up its capacity again, and it could take control of the majority percentage of fields. 5) Brazil has recently discussed changing their pricing methods. What’s your opinion on this? Did it take too long? Is it the right move? My answer is in line with what I have said above. 6) And how do you see PDVSA’s different pricing towards the friendly nations? Is the political benefit worth the financial costs? Any state can, in principle, decide to give some customers, some states, preferential pricing. There is nothing wrong with that in principle. However, it must be seen frankly as a form of foreign aid, for example to an impoverished, small country, to assist that country’s social and economic development. However, in Venezuela these decisions were undertaken autocratically by “el comandante’ without the proper consultation and approval by the national assembly. In addition, these deals were usually made to simply win diplomatic support for Venezuela against the USA, or to get political allies elected in other regional states. In addition, a very important aspect is that any country — neither Venezuela or Brazil — can give away more than it can realistically afford to give in aid to other states. Chavez (and now Maduro too) have made subsidized oil sales to many countries in spite of the fact Pdvsa is incapable of safely and efficiently running its own oil fields, refineries and pipelines at home, and of paying its own bills–and in spite of the fact the Venezuelan state has insufficient cash to support the health, transport, electricitly, education, housing and other domestic public sectors. This is bringing disaster to Venezuela as can be seen in the present state shortage of foreign exchange (dollars) and its big bond market debts. 7) What steps should PDVSA take to become the big oil producer it has the potential to be? 1. The oil sector MUST be overseen by an independent oil ministry and in turn supervised democratically by the national assembly The president of Pdvsa cannot also be the energy minister and the president of the republic must not be able to treat the accounts of the national oil company as his personal political campaign fund. 2. Pdvsa must focus first on mature and/or partially depleted fields where there is already some infrastructure available which can be upgraded and expanded. Some of these fields are lucrative and easy to expand in Venezuela (see my articles on this recently on my blog: GlobalBarrel.com). Then, it can slowly build up the new infrastructure needed to exploit the vast Faja extra-heavy oil fields. 3. The NATION needs to have a frank debate as to what is possible to accomplish with oil rents. The unrealistic ideas about Venezuela being such a “rich” country, and that all is possible to achieve with oil rents need to be overthrown. In reality, while Venezuela indeed can produce a huge amount of oil, as compared to the rich countries in OPEC, aligned with Saudi Arabia, Venezuela is a poor country. Like Iran, Iraq and Algeria, its oil export income per capita are 1/7th to 1/10th of the income per capita of Saudi Arabia, Qatar, UAE, etc. Therefore oil CANNOT be the basis to develop everything in Venezuela. Venezuela must also develop a productive agriculture and non-oil-centered industry — as for example Mexico and Brazil have — to make any progress. This entry was posted in Brazil, Chavez, Chavez lagacy, Chavez legacy, Dilma, Faja of the Orinoco, Hugo Chávez, Latin America, Latin America and Caribbean, Lula, Oil prices, OPEC, PDVSA, PDVSA weakness, Petrobras, Pre-salt, rentismo, Venezuela oil and tagged Brazil, Chavez, Hugo Chávez, PDVSA, Petrobras, United States, Venezuela. Bookmark the permalink. son las rosas, cartuchos, hortensias lirios.